Eighteen year old Lexi Wentworth is cursed. For as long as she can remember, she’s spent every night swimming. If she doesn’t, she’ll regret it—simply walking will be agony, as if she’s stepping on shattered glass. Her body craves the water, demands the water, until she can’t say no. But it's not the swimming that troubles Lexi. It’s the singing that goes with it.When she turned sixteen, her siren song killed the only boy she's ever loved. Now, she avoids the popular shores of the Pacific in favor of a long forgotten lake up in the mountains, where she can swim and sing in peace, far from the population of her oceanside home. Until, that is, Troy Mills discovers her lake. He’s new to Lincoln City High, and he doesn’t know about Lexi’s reputation as an ice queen—a reputation she’s carefully cultivated to keep everyone around her safe. He pushes her, talks to her, forces her to dream of what life could be like if she weren’t a siren. Lexi can’t stop herself from warming to him, from falling for him. 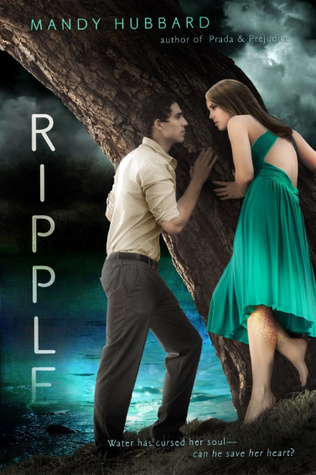 Soon, he’s demanding answers, following her to the lake, unknowingly risking his life. How can she keep him safe when the one thing she wants most--to hold him close-- will endanger his life? Oh, wow. I cannot wait for this one! I love the cover and the synopsis sounds amazing. I read Prada and Prejudice by Mandy Hubbard, and I thoroughly enjoyed it. That makes me even more excited for this one. I haven't read anything by this author yet. This book sounds pretty good though, so I'll definitely be reading it when it comes out. Ripple sounds fantastic! I can't wait for it to be 2011- so many good books coming out!! here's my WoW pick for the week. What a gorgeous cover-I love that girl's dress! I love this cover, and this seems more darker than Prada and Prejudice. Nice pick!